Eeyore is the periwinkle blue donkey of 100 Acre Wood. He is also the depressed pessimistic character of the bunch. Eeyore has a knack for always losing his pinned on tail, which only adds more grievance to his already not-so-sunny disposition. But at the end of the day, Eeyore is always willing to help his friends out. When Sora, Pooh, Piglet, Tigger, Rabbit, and Owl visit the river in 100 Acre Wood, Eeyore is found floating down the river. Sora hurridly jumps to the rescue and gets Eeyore out of the river, when he then tells Sora of his lost tail. Pooh and Sora offer to help Eeyore search for his tail, Sora then pushes Pooh as high as he can on the swing to help Pooh get a good view of the area for the tail. Only when Pooh flies off and lands on Eeyore's house is the tail found to have been inside Eeyore's house all along. A donkey residing in the 100 Acre Woods and one of Pooh Bear's friends. Eeyore is known for several things, but three of them stick out the most. The first - his tail, which he often loses as it is held on by a tack. The second - his constant quest to find a place to call home, as every last one of the houses he built out of sticks fell down before too long. 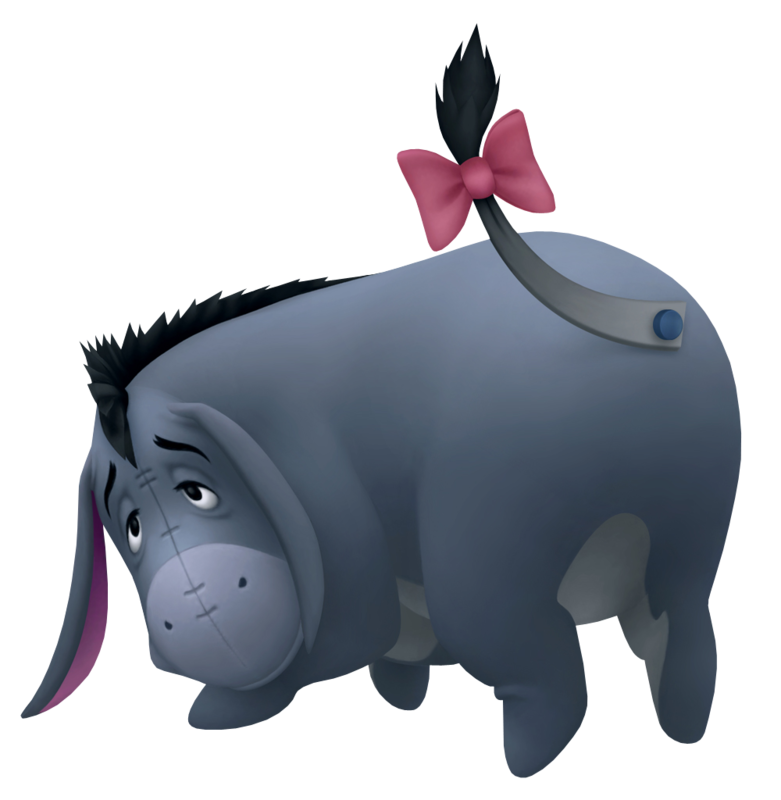 It's no wonder the third thing Eeyore is known for is his gloominess and pessimism, along with an unhealthy dosage of low self esteem. Eeyore became Sora's friend the first time Sora visited the 100 Acre Woods, and greeted the boy on his second visit in his own unique way. Despite his dark views of the world, he was always there to offer Sora a piece of advice he was sure would fail, and was amongst those who promised to keep the boy in their Hearts when they parted again.